Our Harrogate boutique opened in the summer of 2014 and is the most recent addition to Bridal Rogue Gallery! The boutique is spread over two large rooms, lavishly decorated with vintage gold and Venetian glass furniture. Our front room is easily accessible on the ground floor with on street parking available. 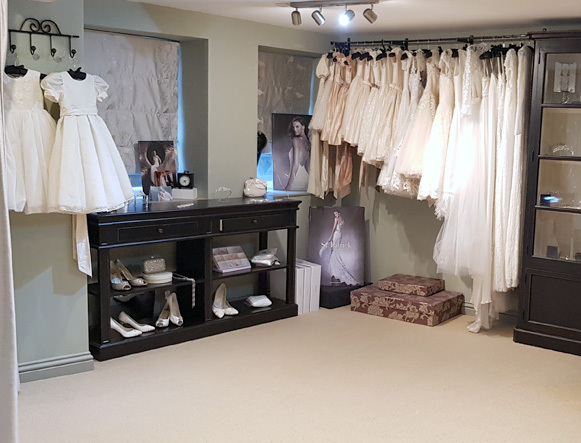 Our front room has a selection of accessories scattered throughout as well as three large rails of our beautiful bridal gowns. There are two comfortable seats for your guests to sink into while you try on dresses behind the luxurious draped curtains. Our second large room is down a flight of stairs, we often use this room for dress fittings as there is plenty of space to move around and it is very private. There is also a selection of accessories and sale dresses in this room. 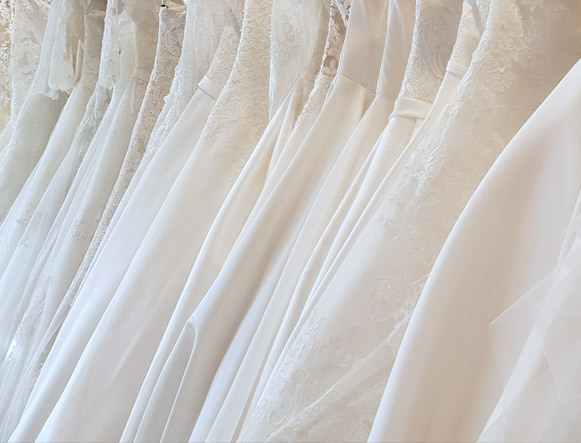 In our Harrogate boutique we stock dresses from luxury bridal designers; San Patrick, Pronovias, Eliza Jane Howell, House of Mooshki, Rembo Styling, Blue Bridal, LouLou, Ivory & Co & Ghost. The majority of our dresses in stock range from UK size 8-16, but we can order dresses in all sizes and are happy to advise plus size brides. If you wish to tweak one of our styles we have an in house alteration service where we can tailor a dress to your needs. We are always open to new ideas and love creating dresses that are individual to each bride. The boutique is located on Strawberry Dale Avenue, only a short walk from the town centre. The shop is in easy reach of Knaresborough, Boroughbridge and Leeds.